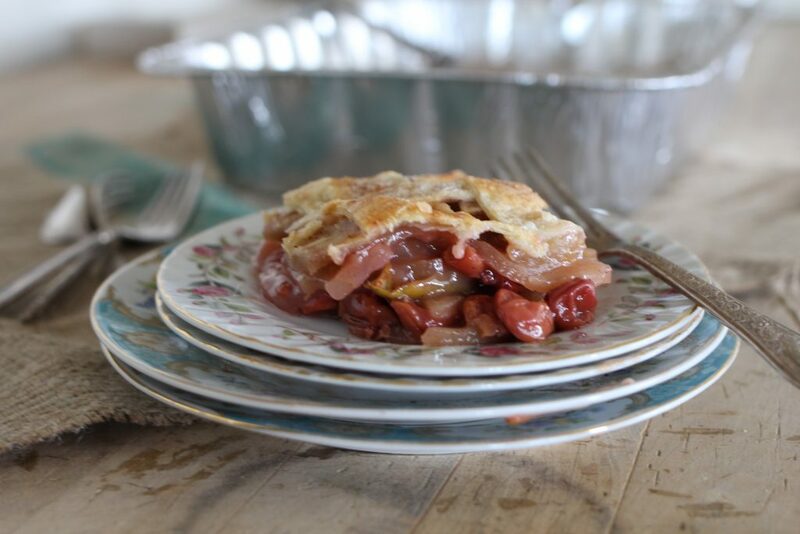 Apple Cherry Pie for a Crowd is the perfect dessert when you want to make pie for a large group, but don’t have the time to prepare traditional pies. This recipe combines some of my favorite pie ingredients along with our family favorite pastry into one amazing simple dessert! Back in the mid 1800’s many of the pioneers on their way to the Salt Lake Valley in Utah, had recently immigrated from Europe to America. Included in the group of pioneers were my ancestors, the William and Jane Johnston Black family from Ireland and England. The Mormon pioneers came from England, Wales, Ireland, Scandinavia, Germany, Spain and Italy to name a few. Their belongings were limited to a few items on their journeys. Many of the people traveling to Utah were poor and had little if anything to bring along on their travels. When the pioneers arrived in the Salt Lake Valley on July 24, 1847, immediate action (July 25) was taken to plant crops so there would be a harvest before the winter months set in. 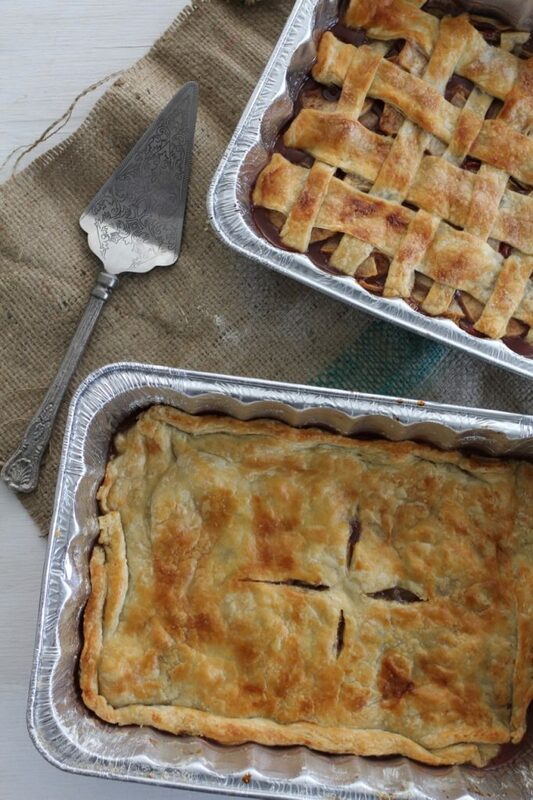 Ditch the pie plate and use a disposable pan for no clean up! The pioneers used dutch ovens or cast iron skillets to make pies back in the day, but disposable pans are my pan of choice when I’m making desert for a crowd in a casual setting. 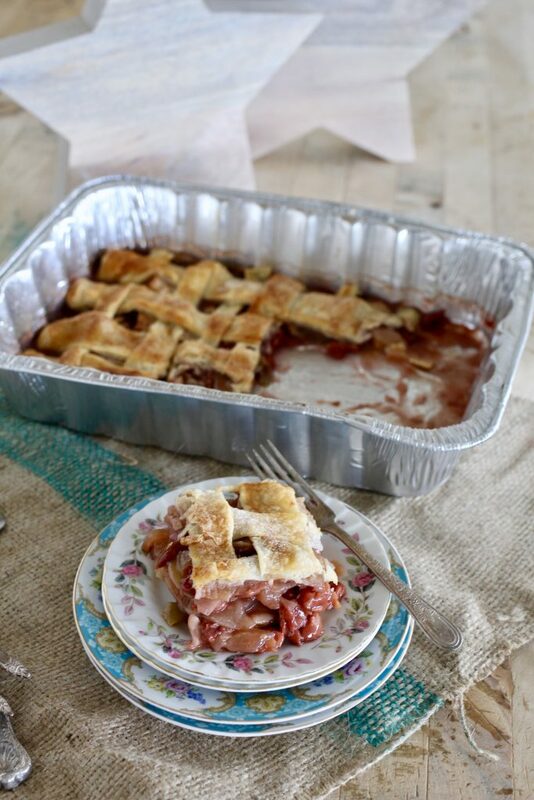 I love the convenience of using a disposable aluminum pan in Apple Cherry Pie for a Crowd. You may use two smaller pans or one steam table size pan to make this dessert (see dimensions on recipe notes). Pie crust – Shortening replaces lard or suet in pioneer crust. When early settlers baked in the 1800’s they mostly used lard (pig fat) or suet(beef fat) in pastries. I’m a fan of solid vegetable shortening in pie crust, because I think it produces the very most tender and flaky crust. Butter in pie crust is popular now, but I trust shortening for the flakiest and lightest pie crust. My tried and true pie pastry recipe for over 35 years includes 4 ingredients and one bowl. Speaking of crust, let’s go bottomless! When I make pie for a crowd in large pans, I leave off the bottom crust. No one misses it, the pie cooks up in less time and you only need one pastry recipe for a steam table pan full of pie. Going without a bottom crust also saves time when assembling the pie because you only roll out the crust one time and lay it on top of the filling ingredients. No crimping edges or getting the pastry to line up perfectly. Just roll out lay on top! The pioneers had fresh or dried fruit to make their Swiss Apple Cherry Pie, but I use canned when I can’t find fresh sour pie cherries. Honestly, there is not much of a difference once the cherries are baked. Sour cherries are only available a few weeks of the year, so I’ve resorted to using canned cherries in water or frozen pie cherries in my Apple Cherry Pie for a Crowd. Fresh, canned, or frozen, the most important thing to remember is to drain the fruit well before adding to the apple mixture and to not purchase cherry pie filing (remember, cherries in water). I can’t wait to hear about your experiences when making this pie. Leave a comment here and share (tag) a photo on Instagram, I love to see your creations in the kitchen! Cut in shortening with pastry blender or knives until the shortening is the size of small peas. Fold with fork until flour is absorbed and dough comes together. Flour surface and rolling pin well. Flatten dough gently with hand to make oval shape. Roll out from center to about 1/8” thickness. roll dough to fit the pan. 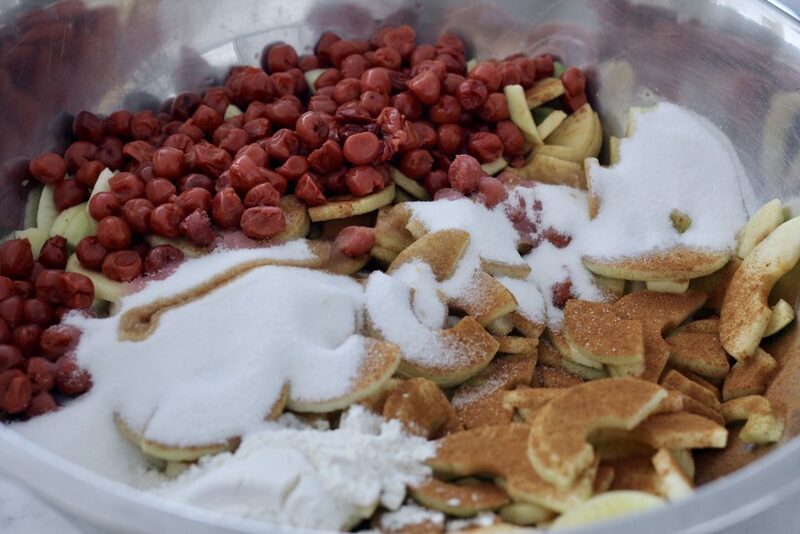 Fold dough in half, lift onto pan after filling has been poured into pan and butter placed on top of fruit. Open folded pie dough and shape to pan. Preheat oven to 400 degrees. Place rack in middle of oven. Prepare crust. Roll out crust ann set aside until ready to top pie. Place cut up apples in large bowl and mix gently with sour cherries. Add rest of filling ingredients. 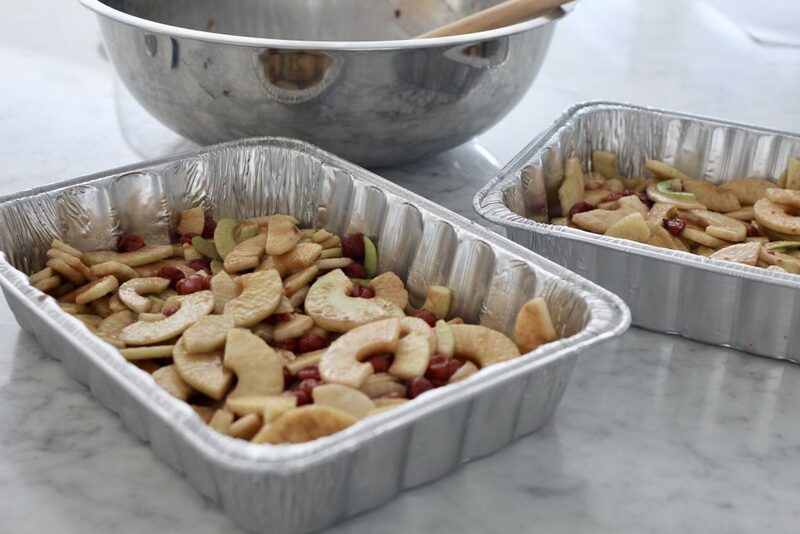 Fill pan with apple cherry mixture. Place rolled out crust on top of filling in pan. Dot with butter, if using. Make slits on top of pie for steam to escape. Brush with egg wash if desired, sprinkle with 2 tablespoons sugar. Bake for about 45 minutes or until filling is bubbly and crust is golden. Cover loosely with foil if crust is getting too brown. 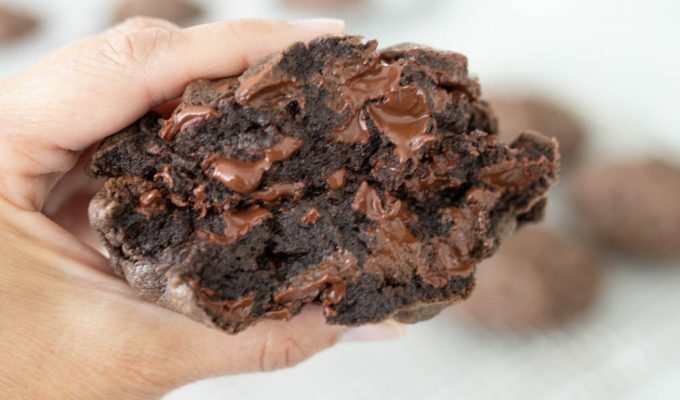 Total baking time is usually 45-50 minutes but may vary in your oven. Remove pie from oven and let cool for at least 2-3 hours before serving. Dough may be easier to handle if chilled for an hour or so. Try rolling the dough around the rolling pin and then unrolling right onto the pan. Try ½ regular and ½ butter flavor Crisco. Some people like to “cut” the flour in with their fingers. Don’t cut the flour and shortening too much, the pieces of shortening are what make the crust flaky, you want to have pebble or pea size pieces of dough before adding the water. Brush beaten egg white or a whole egg, beaten over your pie dough before baking to produce a shinier crust. I also sprinkle on a bit of sugar before baking after the egg wash is brushed on. Steam table pans measure 12"x 20" or for the half size, or 10 3/8" x 12 3/4"
How many do you think this bad boy would serve? It might be just the thing for a yummy, mostly authentic trek dessert. 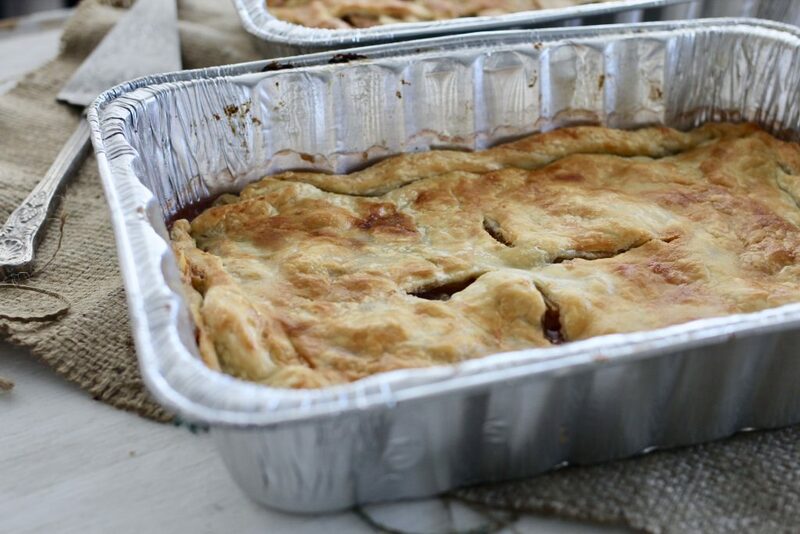 One large steam table pan feeds 24 (4×6 slices) If I was making this for trek I’d use canned apple pie filling and add plain drained cherries in water and then make a homemade cobbler or crisp topping to simplify!